This made 8 servings for Carol and me. This last weekend on a camping trip, we made a double-batch in 3 Dutch ovens (i.e. 2/3 recipe in each Dutch oven), and fed 8 boys and 4 adults. I used aluminum foil on a picnic table to provide a clean surface for shredding the chicken. Preheat the oven to 350 degrees and grease an ovenproof dish. Saute the bacon in a frying pan. When crisp, remove any excess grease, and add the onion, carrots, and celery. Saute until the vegies are softened. Remove from heat. Stir in the peas. Put the chopped chicken meat on the bottom of the baking dish. Spread on top of the chicken the bacon-vegetable mixture. Heat the frying pan and melt the butter, Whisk in the flour and stir until the flour-butter mixture has taken a little color, about a minute. Slowly whisk in the chicken broth, bring to a boil and simmer for about 5 minutes, stirring frequently, until the sauce has thickened. Stir in the half-and-half, and cook another 3 minutes. If using, stir in the sherry and nutmeg. Spread the sauce on top of the vegetables. Half the biscuits and put them on top of the sauce. 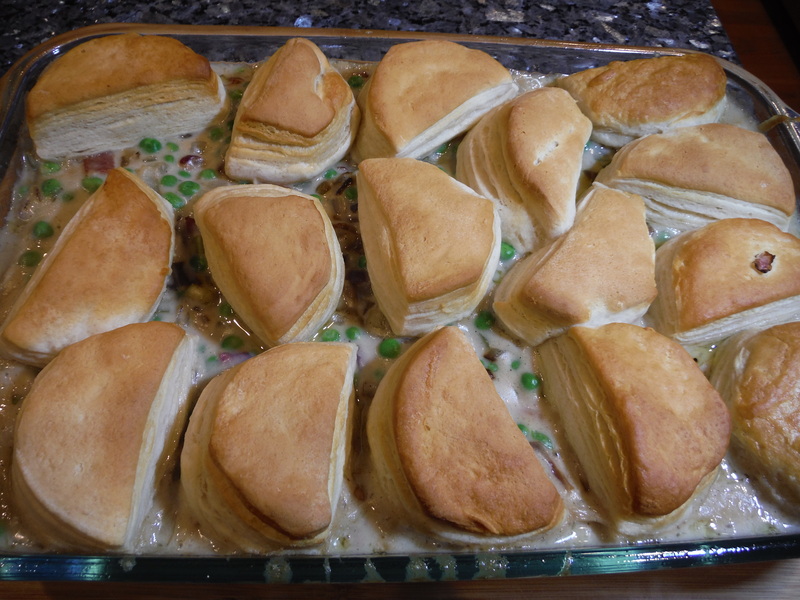 Put in the oven and bake until the biscuits are browned and cooked through, about 20-25 minutes.